The Milwaukee County Zoo regrets to announce female snow leopard, Tomiris, was euthanized recently due to quality of life issues. Just shy of her 18th birthday (date of birth: May 28, 2000), Tomiris was considered an older animal. Tomiris arrived at our Zoo from the Woodland Park Zoo in Seattle, Washington in 2005. She became a favorite of both zookeepers and visitors, as keepers comment that she was special, and had a big part of the staff’s heart. She’d greet the keepers with a “grump” and a rub on the outside exhibit fencing each morning. She will be missed, but continue to serve as an educational ambassador for her wild counterparts. 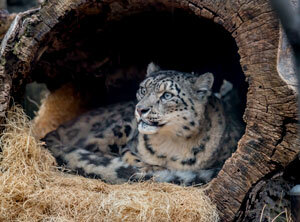 The Zoo’s two other snow leopards, female, Oyra, and male, Asa, appear to be doing fine.